Enduring quad-core. Lenovo equips a small 11.6-inch laptop with an AMD quad-core processor, and demands less than 400 Euros (~$547) for the bundle. Our test report reveals whether Lenovo has created the perfect compromise of size, performance, and price. 11.6-inch laptops are quite popular. Their compact size and low weight make them handy and portable, and they often provide the same convenience as larger laptops. 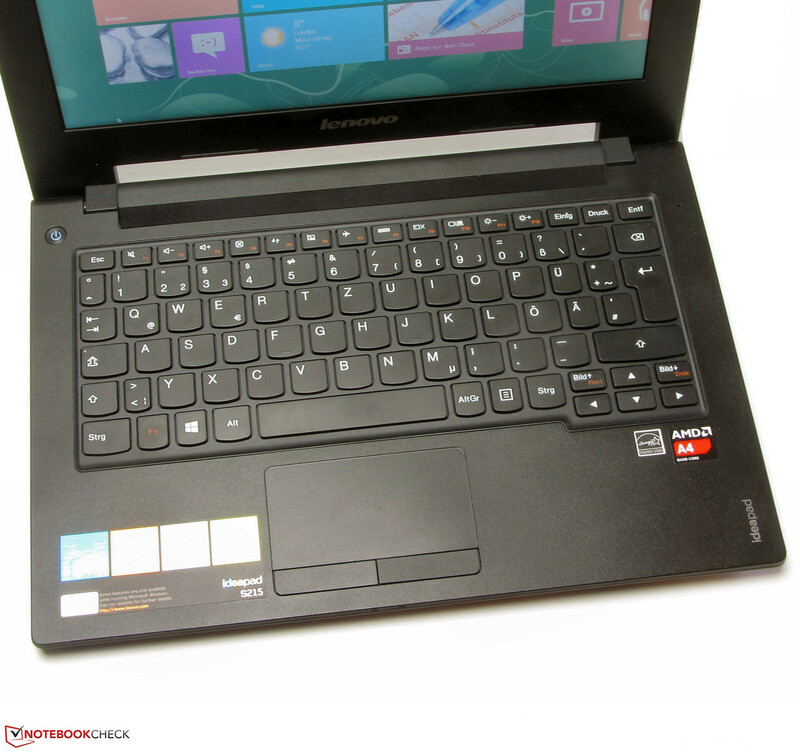 Lenovo now expands the range of this laptop category with its IdeaPad S215. 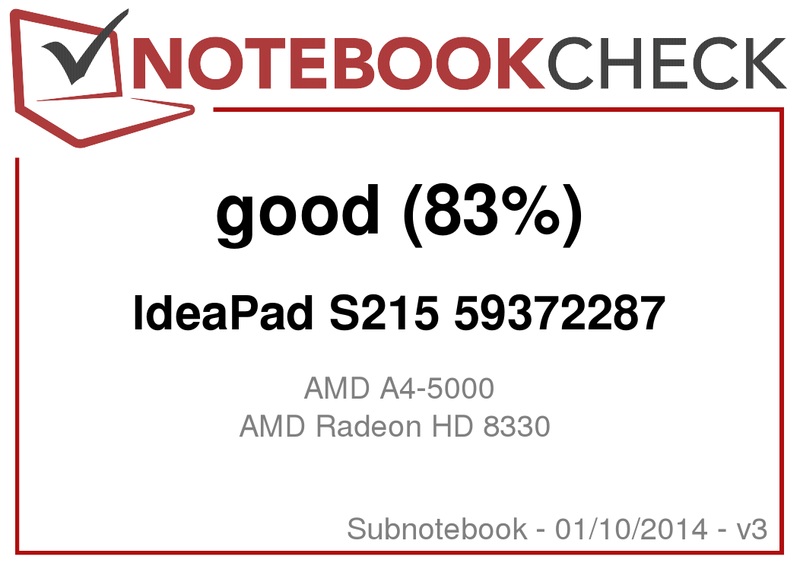 The laptop is no stranger: We tested the identically built, Intel-based IdeaPad S210 Touch (Pentium 2127U, HD Graphics (Ivy Bridge)) counterpart only a few months ago. Unlike the S215, the S210 model we tested featured a touchscreen. The S210 reaped in a "Good" (81%). Read in our test report whether the IdeaPad S215 can keep up with its Intel counterpart, or whether it even excels. We used the Toshiba Satellite NB10t-A-101 (Celeron N2810, HD Graphics (Bay Trail)) and the Acer Aspire V5-131 (Celeron 1017U, HD Graphics (Ivy Bridge)) to classify the laptop. Since the IdeaPad S215 is identical with the S210, we will not go in-depth about casing, connectivity, input devices, or speaker - apart from describing a few minor differences. 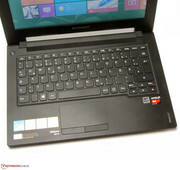 Information about the mentioned components can be read in the review of the IdeaPad S210. 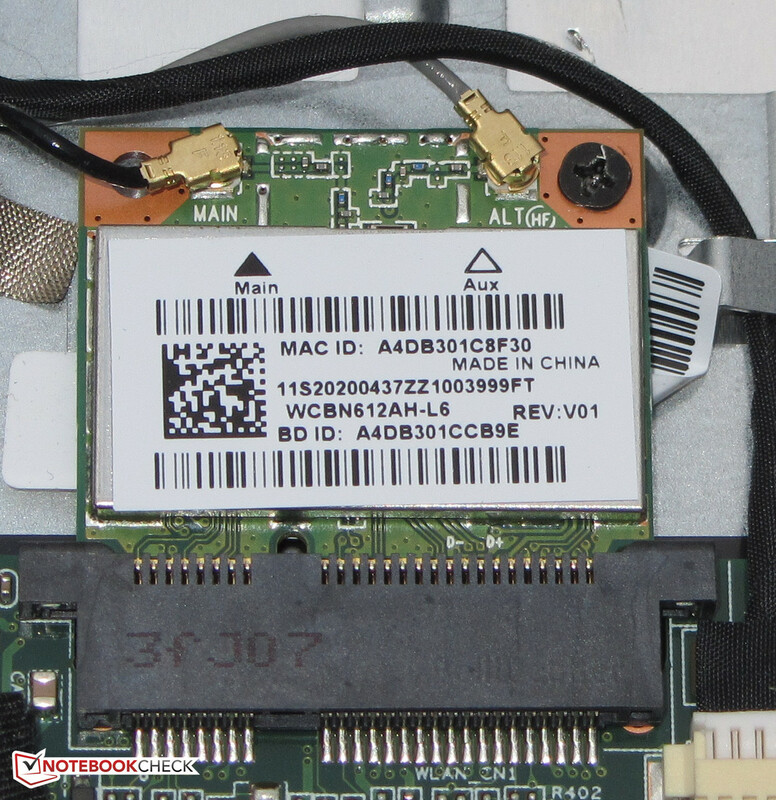 The IdeaPad S210 and IdeaPad S215 are identical in build. However, the S215 is approximately 2 mm thinner than its counterpart because it does not feature a touchscreen, and thus has a thinner lid. The most obvious difference between both laptops is their color. 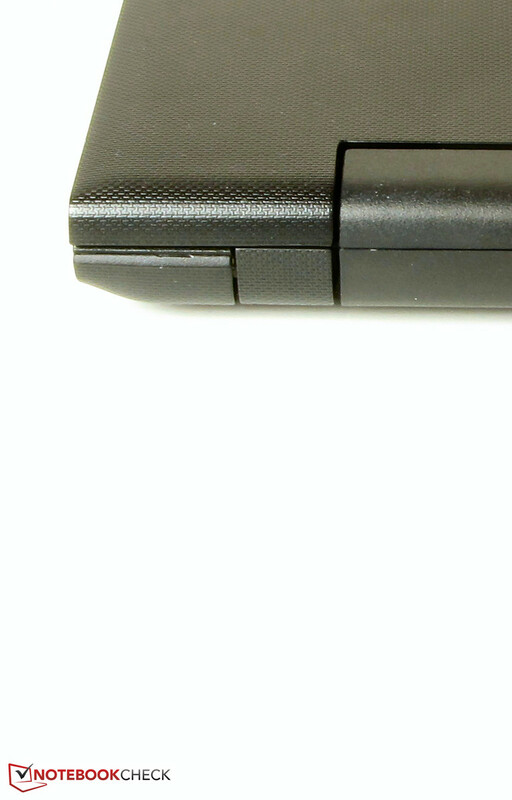 While the S210 model that we tested was completely white, the S215 is clad in black. 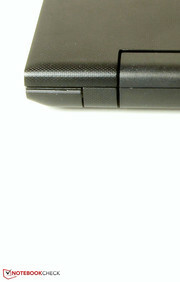 The 210 is also available in black. 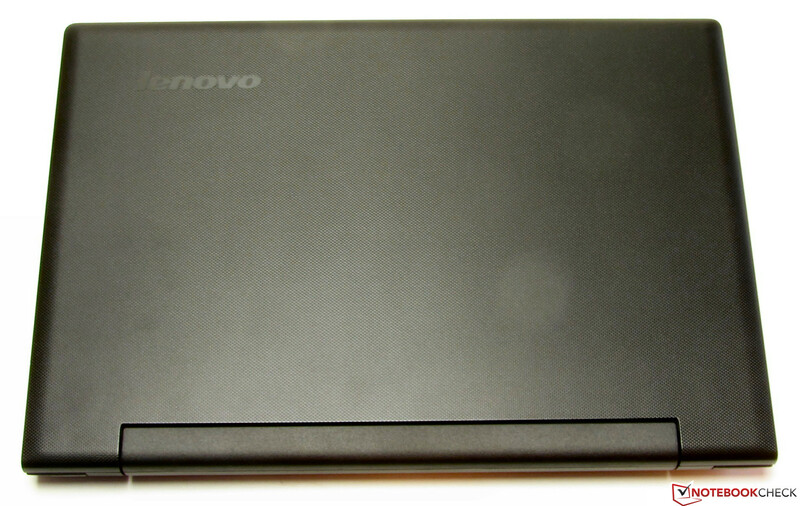 The IdeaPad is completely made of matte, black plastic. The lid's back is structured. The Windows 8 (64-bit) operating system is pre-loaded. 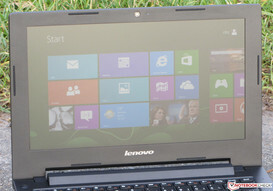 Lenovo does not include a Windows 8 DVD. 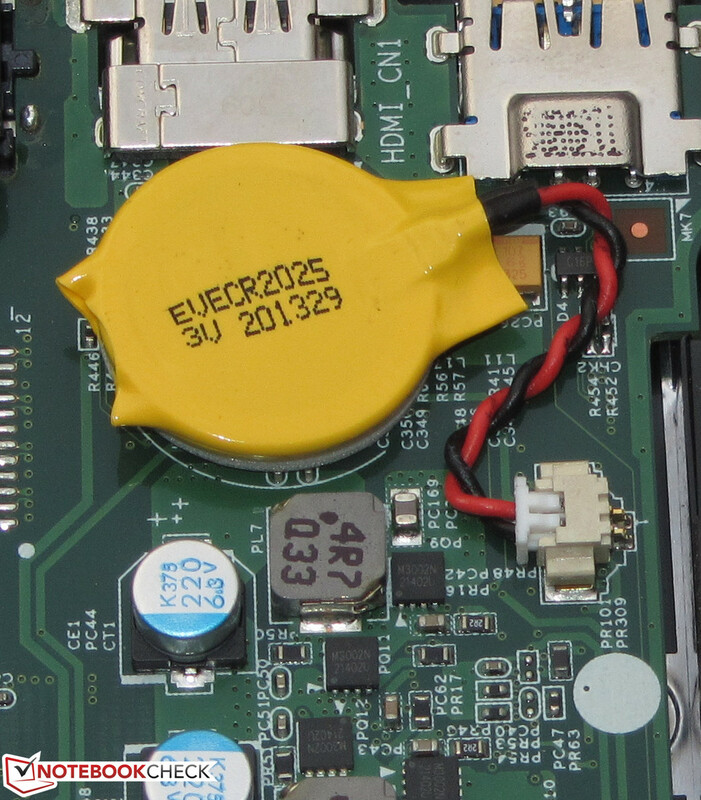 Like all Lenovo laptops, the S215 also features the OneKey Recovery System. It, for example, allows restoring the operating system or resetting the laptop to factory state. The OneKey Recovery button has to be pressed when the laptop is off to start the recovery system. The small button is located on the laptop's left. The laptop is powered and displays a menu where the option "System Recovery" can be selected. Users who want to replace Windows 8 with Windows 7 should not encounter problems. 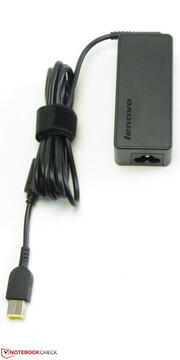 Lenovo provides drivers for all current Windows version (Windows 7/8/8.1) on its website. Lenovo omits a maintenance cover. 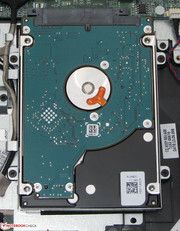 The base unit's underside has to be removed should the user want to, for example, exchange the hard drive. All screws on the underside have to be removed for this. Note: Screws are also hidden underneath both rubber stoppers. The stoppers can simply be folded back, and are not glued. The tray can then be lifted off with a putty knife. Note: The tray is secured with small plastic hooks. We would recommend looking at Lenovo's Hardware Maintenance Manual before opening the casing, where the procedure is explained in detail. 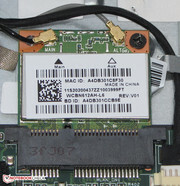 The working memory, hard drive, Wi-Fi module, BIOS battery, and fan can be accessed after opening the casing. The latter can be taken out for cleaning purposes. 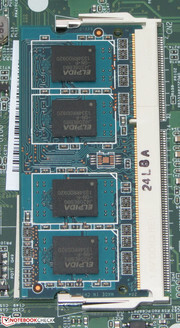 Lenovo only builds in one working memory bank in the S215, which is furnished with one 4 GB module. 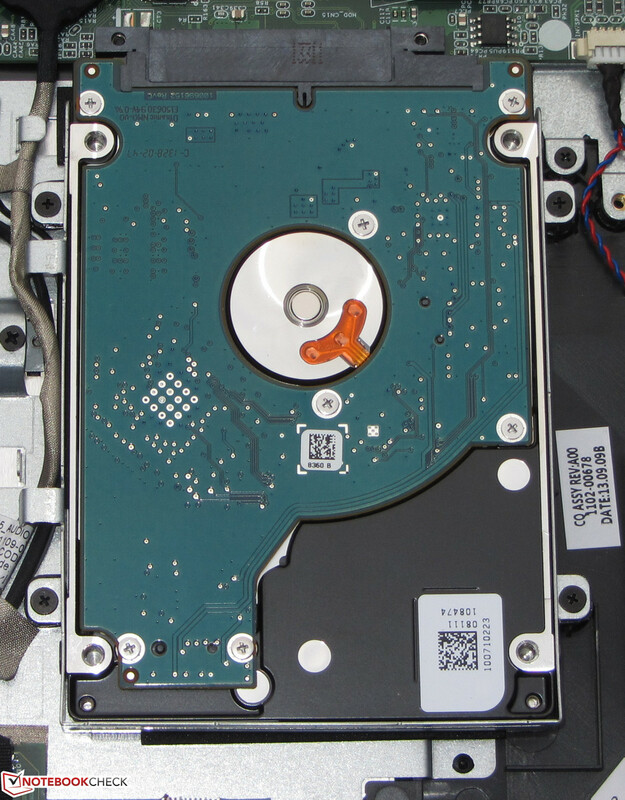 Only 2.5-inch hard drives with a height of 7 mm can be used when replacing the hard drive. Lenovo installs a matte, 11.6-inch screen with a native resolution of 1366x768 pixels in the IdeaPad. The average brightness of 197.6 cd/m² places the screen in the midfield. The Aspire (194.4 cd/m²) is on par, and the Satellite achieves much poorer rates (161.9 cd/m²). Both the screen's contrast of 383:1 and black level of 0.58 cd/m² are at most middling. The Aspire (441:1, 0.43 cd/m²) is only slightly better than that of the S215. However, the Satellite (791:1, 0.22 cd/m²) achieves better rates. The IdeaPad's screen cannot reproduce either the AdobeRGB or the sRGB color spaces. 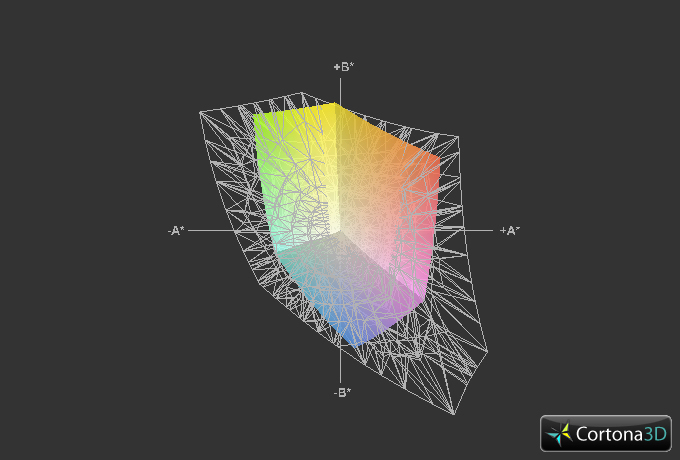 The coverage is 53.6% of sRGB, and 37.6% of AdobeRGB. 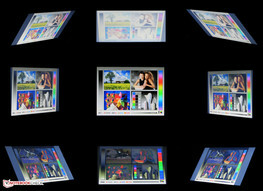 These color spaces are important for professional image editing, for example. We assessed the screen in its default state (target color space: sRGB), and established an average DeltaE 2000 shift of just below 7.6. This rate is a bit better than we know from most laptops, in particular from the low-budget sector. No color achieves the target range (DeltaE smaller than 3). The screen exhibits a bluish cast. The screen's low contrast and only middling brightness do not exactly suggest outdoor suitability. Nevertheless, this should still be possible in not overly bright surroundings. The viewing angle stability is within the range that the laptop's price would let us presume: There is a lot of elbow room horizontally, and even several viewers can look at the screen at the same time. The content can still be read from the side, but the image dims with an increasing angle. Altering the vertical viewing angle on the screen quickly leads to image distortion though. 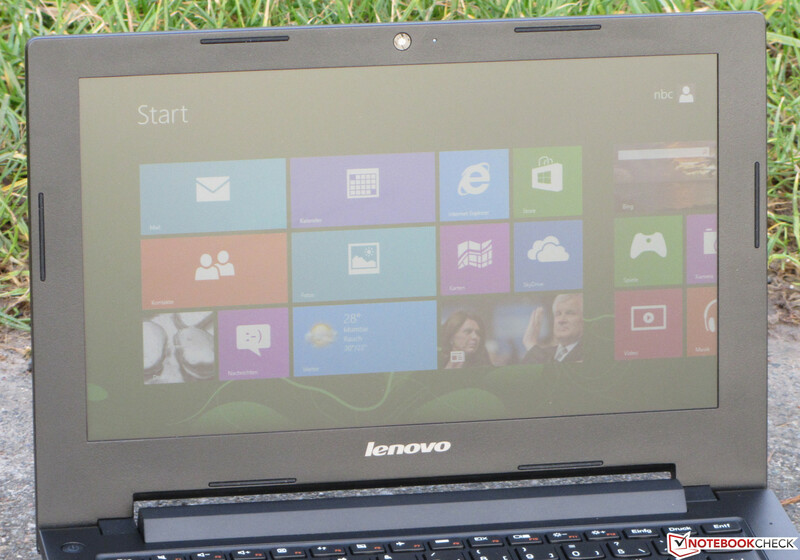 Lenovo has a small, 11.6-inch laptop in its product line with the IdeaPad S215. It provides enough power to perform routine tasks, such as Internet research, typing, Skype calls, etc. Even playing videos - including Full HD material - is no challenge for the laptop. The IdeaPad's GPU features a decoder that unloads the processor during playback. The IdeaPad is currently sold for approximately 380 Euros (~$520). We did not find alternative configurations. There are more options in the identical IdeaPad S210 lineup. Models based on Pentium or Core i3 are available here. Some models also feature a touchscreen. The currently lowest priced member of this range is the IdeaPad S210 59397113 with a Pentium 987 for approximately 300 Euros (~$410). However, it does not include a Windows operating system. 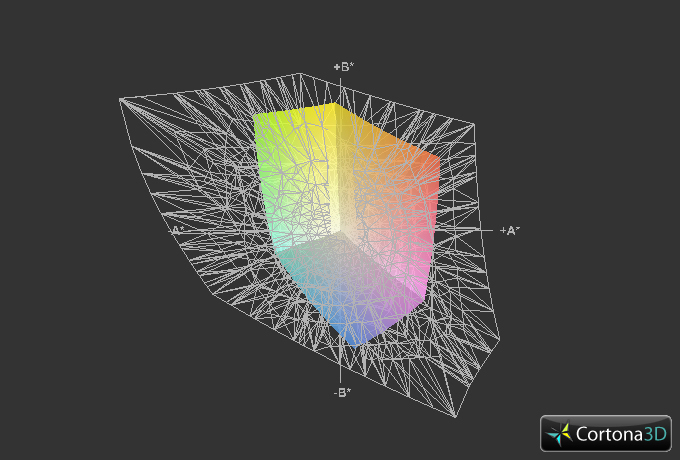 We previously tested a model from the series with the IdeaPad S210 Touch (Pentium 2127U, HD Graphics (Ivy Bridge)). 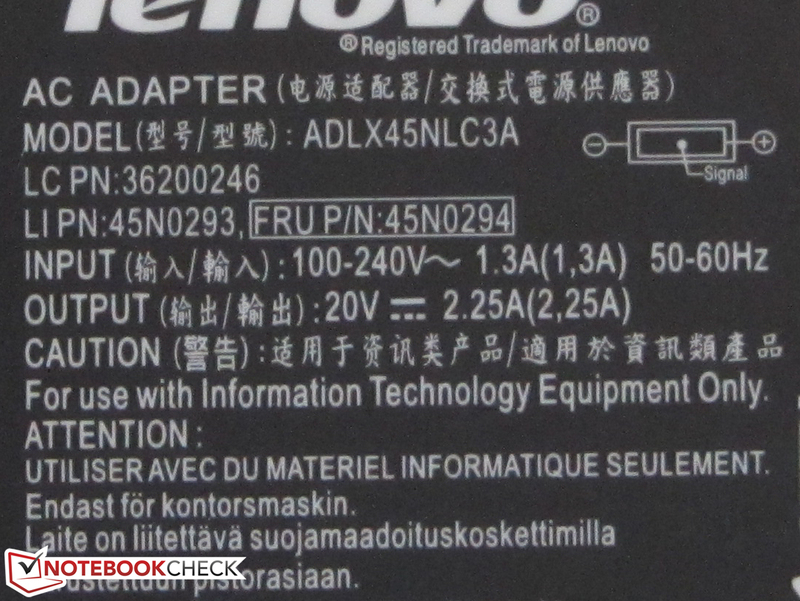 Lenovo installs AMD's A4-5000 APU in the IdeaPad. It comes from the latest Kabini generation. The APU's CPU part is a quad-core processor that clocks with a speed of 1.5 GHz. It does not feature Turbo. The APU is not excessively power guzzling. AMD specifies the APU's TDP with 15 watts. More information and many benchmark scores can be found in our short review of the APU. The processor always performed the Cinebench benchmark's CPU tests with full speed (1.5 GHz). 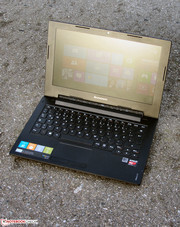 The IdeaPad is generally on par with the Aspire (Celeron 1017U, HD Graphics (Ivy Bridge)) in the multi-thread tests. However, it cannot compete with the Aspire in the single-thread tests, and is clearly inferior. Consequently, the Aspire has an advantage in routine use because single-thread applications are still prevalent here. 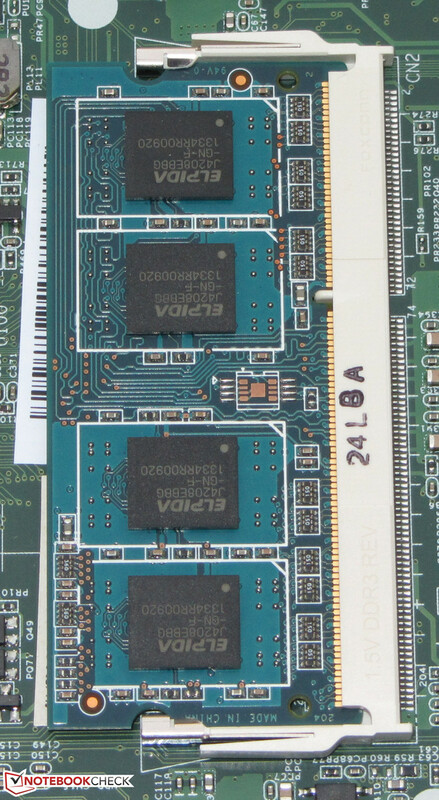 The Satellite (Celeron N2810, HD Graphics (Bay Trail)) is on par with the S215 in single-thread applications, but clearly lags behind in multi-thread applications. Overall, the Aspire sports the strongest processor. The IdeaPad won the GL test of the Cinebench R11.5 benchmark. The system runs smoothly to the largest extent. Delays are sometimes noticed when file content is being loaded, or while opening a window. The PCMark benchmark scores are on the level that we know from laptops based on AMD APUs. The Satellite (Celeron N2810, HD Graphics (Bay Trail)) is on par with that. This demonstrates that the single-thread performance has a greater influence than the multi-thread performance in everyday use. The IdeaPad would otherwise have the lead on the Satellite. Neither contender can compete with the Aspire's (Celeron 1017U, HD Graphics (Ivy Bridge)) score. It sports the overall strongest processor. The IdeaPad's overall performance could be increased considerably by installing a solid state drive. The system boots faster, and responds swifter on the whole. The PCMark benchmarks scores also skyrocket. We tried this: Our Crucial RealSSD C300 (64 GB) improved the PCMark 7 score by almost 64% to 2415 points. Data is stored on a hard drive from Seagate's Momentus Thin line. It has a capacity of 500 GB and spins with 5400 revolutions per minute. CrystalDiskMark recorded a read speed of 107.3 MB/s and HD Tune delivered an average transfer rate of 83.5 MB/s. Overall, the hard drive accomplishes decent results. In particular, the 4k read rates are compelling. 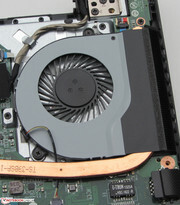 The graphics core in the IdeaPad also comes from AMD. The GPU is dubbed Radeon HD 8330 and it supports DirectX 11.1. It clocks with a speed of 500 MHz, but does not feature Turbo. The IdeaPad scores better than both the Satellite (Celeron N2810, HD Graphics (Bay Trail)) and Aspire (Celeron 1017U, HD Graphics (Ivy Bridge)) in all 3DMark benchmarks. That was expected because the S215 sports the strongest graphics core. Its performance is roughly on a level with Intel's HD Graphics 4000. The IdeaPad's primary application field is not found in computer games. Nevertheless, the compact laptop can smoothly render a few games in a low resolution and low quality settings. We have tested a few laptops based on the A4-5000 APU, and therefore know that the list of playable games includes Grid 2, StarCraft II: Heart of the Swarm, Dead Space 3, and all editions of the FIFA series, among others. The latter can even be played smoothly using higher resolutions, and a higher quality level. 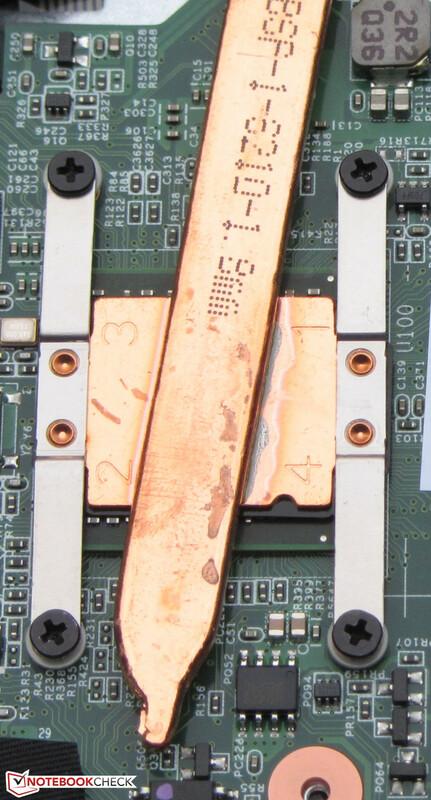 Most laptops with an integrated GPU can be beefed up to an extent with a second working memory module. The working memory then operates in dual-channel mode, which maxes out the GPU better. Consequently, it achieves up to 20% higher frame rates. The IdeaPad does not have this option for two reasons: First, the installed memory controller only supports single-channel mode, and second, the laptop only has one working memory bank. The laptop did not annoy us greatly with noise - neither during load nor in idle mode. The fan even often stood still in idle mode, and thus only the base noise, and the hard drive's operating noise was usually audible. The noise level was 31.2 to 32.6 dB. The Satellite (31 to 32.5 dB) ranges on the same level and the Aspire (29.8 to 31 dB) offers marginally better rates. The IdeaPad's noise level barely increased in either medium load via 3DMark06 with 32.6 dB, or full load in the stress test via Prime95 and Furmark with 32.8 dB. The noise levels of the Aspire (32.3 and 32.6 dB) are just as good, but the Satellite (31 dB) can provide slightly better rates this time. All three laptops in comparison sport a low-voltage CPU or APU. Therefore, none of the laptops reach excessive surface temperatures - neither in idle mode nor in full load. The Satellite achieves the highest temperatures, and surpasses 40 °C in multiple measuring points (maximum: 43.2 °C). This is a bit surprising seeing that the processor in the Satellite has the lowest TDP (7.5 watts; IdeaPad 15 watts; Aspire 17 watts). The reason is soon found: The Satellite's fan is inactive even during full load. 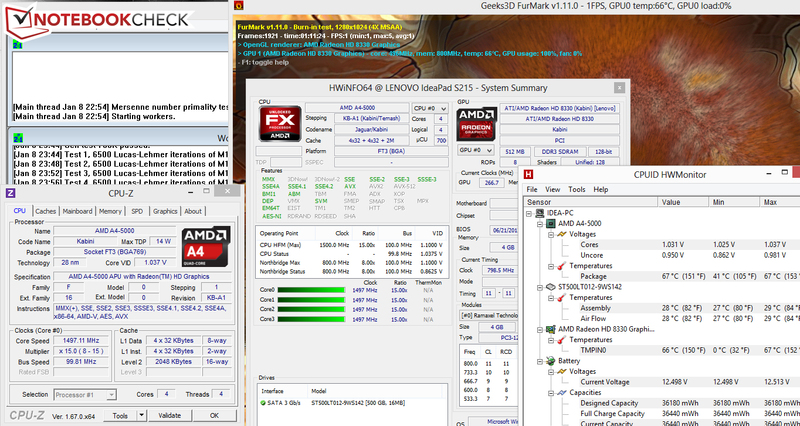 The CPU ran the stress test (Prime95 and Furmark run for at least one hour) with 1.5 GHZ in both AC and battery mode. The GPU's speed was at least 267 MHz in AC mode. It was occasionally boosted to 400 to 500 MHz. The GPU's behavior was exactly the same when the stress test was performed in battery mode. However, the graphics core was sped up to a maximum of 400 MHz. The CPU's temperature settled to approximately 67 °C in the stress test (AC mode). (+) The average temperature for the upper side under maximal load is 28.9 °C / 84 F, compared to the average of 30.7 °C / 87 F for the devices in the class Subnotebook. (+) In idle usage, the average temperature for the upper side is 26.4 °C / 80 F, compared to the device average of 30.7 °C / 87 F.
(±) The average temperature of the palmrest area of similar devices was 28.6 °C / 83.5 F (-1.6 °C / -2.9 F). 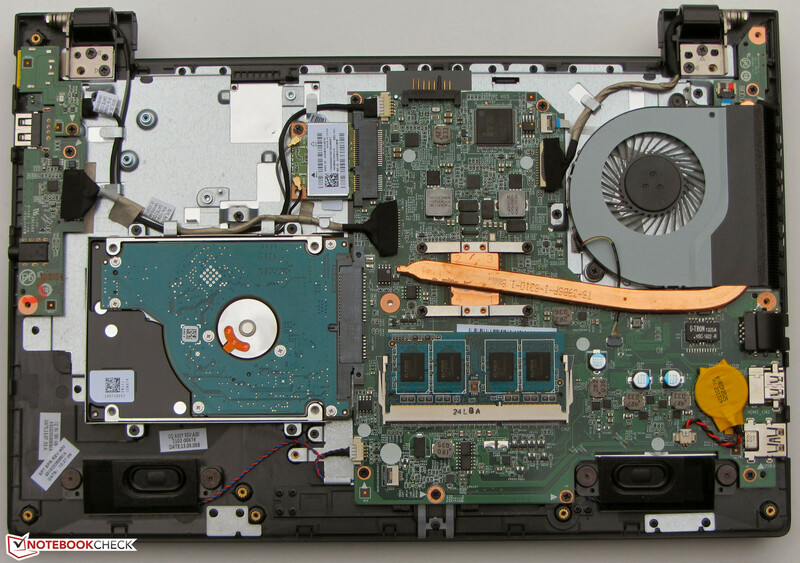 The IdeaPad's idle power consumption ranges from 3.7 to 7.8 watts. Both the Aspire (4.5 to 7.3 watts) and the Satellite (6 to 7.6 watts) are roughly on par with that. The S215's rates climb to 17 watts in medium load via 3DMark06 and 21.1 watts in full load during the stress test via Prime95 and Furmark. 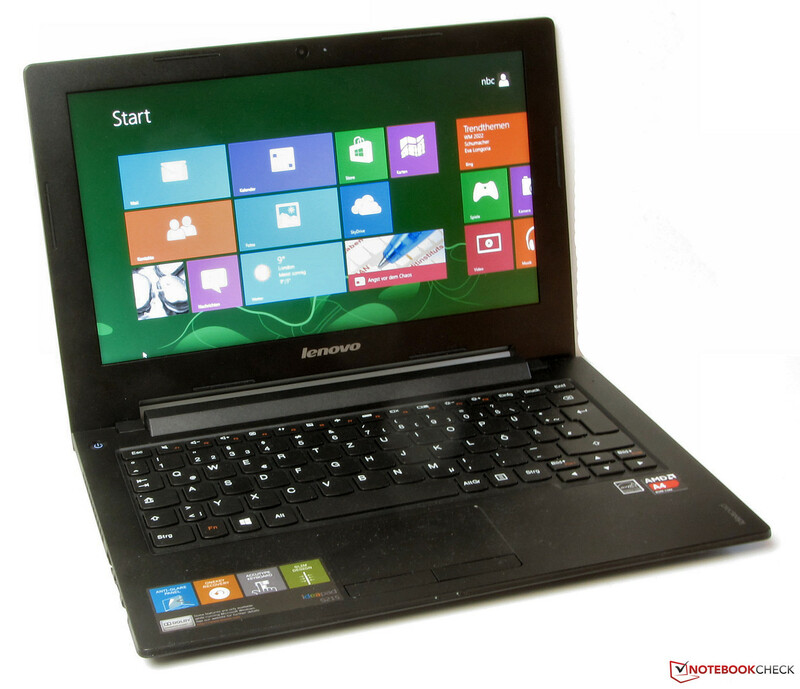 Thus, the IdeaPad places itself between the Aspire (20.3 and 24.7 watts) and the Satellite (9.5 and 12.5 watts). The Satellite's lower load power consumption was expected because the installed processor has a TDP of only 7.5 watts (IdeaPad: 15 watts; Aspire: 17 watts). The battery in the S215 lasted for 9:20 h in idle mode. It thus places itself between the Aspire (12:15 h) and the Satellite (5:20 h). The idle mode is ascertained using Battery Eater's Reader's test. The screen is set to minimum brightness, the energy-saving profile is enabled, and the wireless modules are turned off. The IdeaPad's battery was drained after 2:03 h of load. It is on par with the Satellite (2:05 h), but clearly lags behind the Aspire (3:49 h). 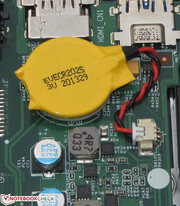 The load runtime is determined via Battery Eater's Classic test. The screen is set to maximum brightness, the high-performance profile is enabled, and the wireless modules are on. The IdeaPad shut down after 5:02 h in the Wi-Fi test. Again, it places itself between the Aspire (5:52 h) and Satellite (2:52 h). Websites are opened automatically every 40 seconds, the energy-savings profile is enabled, and the screen's brightness is set to approximately 150 cd/m² for this test. We used the video clip Big Buck Bunny to ascertain the video playback runtime in battery mode. It runs in a loop while the energy-savings profile is enabled, the wireless modules are disabled, and the screen's brightness is set to 150 cd/m². The IdeaPad managed a runtime of 4:03 h here, and thus does better than the Satellite (3:11 h). We did not perform this test with the Aspire. Overall, the S215's battery runtimes are good. 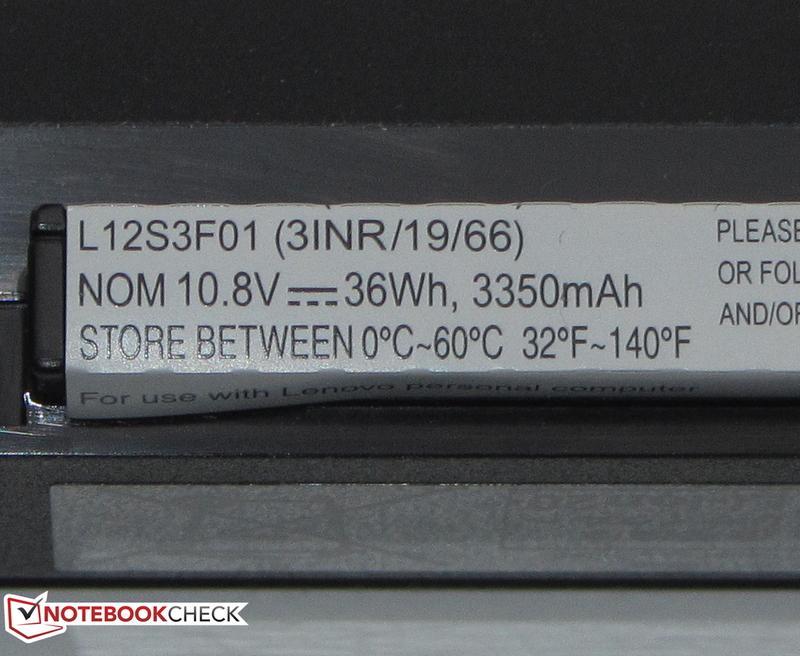 The relatively small battery prevents better runtimes (IdeaPad: 36 Wh; Satellite: 24 Wh; Aspire: 56 Wh). The Aspire has the longest runtimes because it sports the highest capacity battery. Lenovo's IdeaPad S215 offers a decent application performance that absolutely suffices for most tasks that an 11.6-inch laptop should be able to deal with. 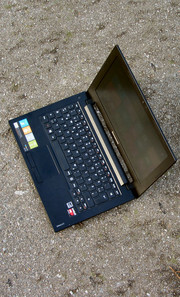 The IdeaPad operates quietly over the entire load range, and the laptop does not consume much power. It translates this low requirement into good runtimes despite of its relatively low capacity battery. Here, the S215 clearly defeats its Intel counterpart, which has the same battery size. We also like the two year warranty period. However, compromises have to be made in terms of screen. Lenovo only supplies an averagely bright, low-contrast model. Beyond that, we have to criticize the maintenance options. The hardware can only be accessed by opening the casing. 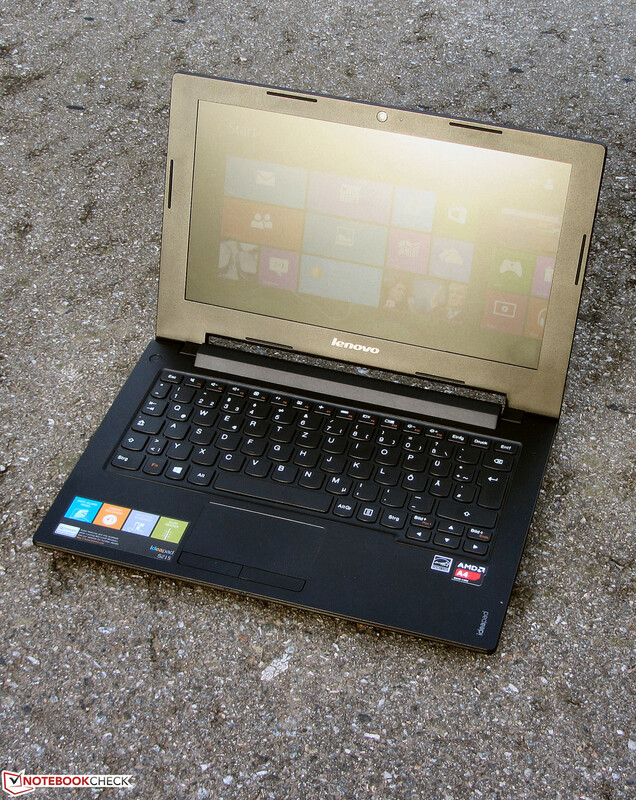 The price of Toshiba's Satellite NB10t-A-101 is on par with the IdeaPad. It, however, does not offer as much computing power, but excels with the overall lowest power consumption. Unfortunately, it cannot convert this quality into long battery runtimes because it has an even lower capacity battery than the IdeaPad. Acer's Aspire V5-131 is interesting when as much computing power and the longest possible battery runtimes are wanted. The laptop has the lead in both categories. It also provides easy access to the innards owing to a large maintenance cover. The Aspire also has the lead in terms of price: The Aspire is the lowest priced device among our three comparison laptops. It is currently available for 300 Euros (~$410) with a Celeron 1007U processor. The laptop is sold for just 250 Euros (~$342) should a Windows operating system not be required. 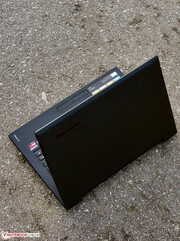 Finally, we would like to point to another alternative from Lenovo: The ThinkPad Edge E145 (AMD E1-2500, Radeon HD 8240). The laptop does not provide as much performance as the IdeaPad S215, but it can offer a very good keyboard, extremely long battery runtimes (idle: 19:43 h; Wi-Fi: 8:19 h; full load: 4:01 h), a bright screen, and easy maintainability. The laptop reaped in the third place in our Subnotebook Top 10 List, and it has been there for a few months already. Its price of approximately 370 Euros (~$506) is on par with that of the IdeaPad, and the laptop is available for a price starting at 320 Euros (~$438) without an operating system. 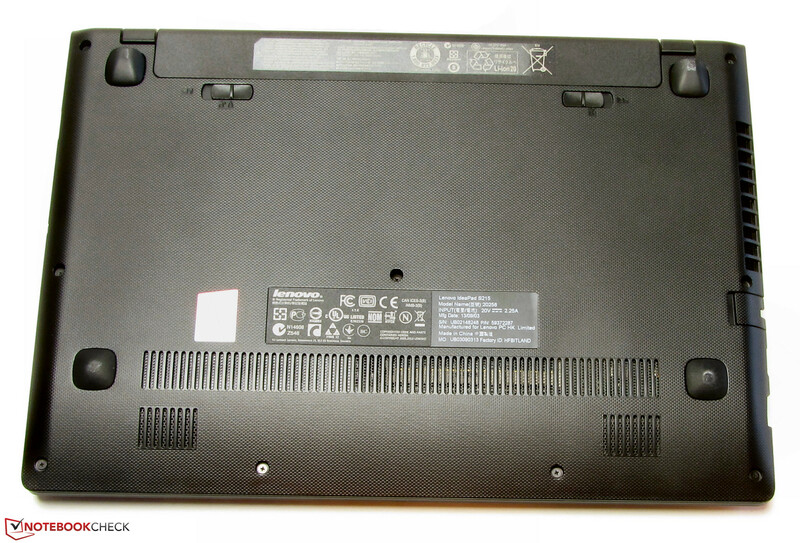 The ThinkPad is also available with an A4-5000 APU. However, we could only find the corresponding model in Lenovo's shop. The underside has to be removed to access the hardware. There is only one working memory bank. Swapping the hard drive is no problem. The fan can be taken out for cleaning. ...and provides a capacity of 36 Wh. The power supply weighs approximately 177 grams. It has a power output of 45 watts. 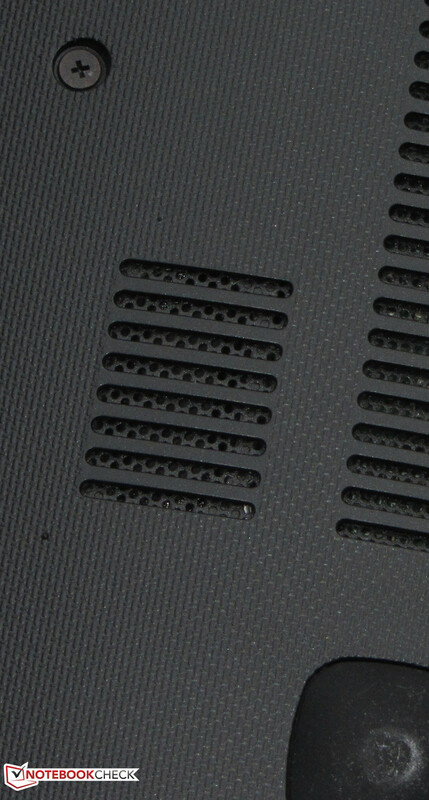 The speakers are on the laptop's underside. The decent battery runtimes and the low operating noise. We don't see a two-year warranty on a low-budget range laptop every day. Toshiba Satellite NB10t-A-101, Acer Aspire V5-131, Lenovo IdeaPad S210 Touch, Lenovo ThinkPad Edge E145, HP Pavilion TouchSmart 11-e000sb, Acer Aspire V5-122P-61454G50NSS, Lenovo ThinkPad Edge E135, Lenovo ThinkPad Edge E130, Acer Aspire One 725-C7Xkk, Acer Aspire One 756-B847X.